Nokia's stock price just jumped by more than 15% after their preliminary results for Q4 2012 delivered better than expected profitability. Nokia has also claimed that Lumia sales were "better than expected", but as the shipment chart above shows, that seems to be caused by low expectations. This essentially confirms my hypothesis that Lumia 920 sell-outs were a function of supply, not demand. As I expected, Nokia did post strong sequential growth in Lumia shipments, but that was primarily driven by the WP8-driven shipment crash in Q3. Lumia shipment growth from Q2 to Q4 was just 10%, which shows that demand for Windows Phone devices remains considerably weak compared to the broader market. In addition to this, the market for Symbian smartphones continues to shrink rapidly and Nokia's position in the smartphone market looks considerably weak. 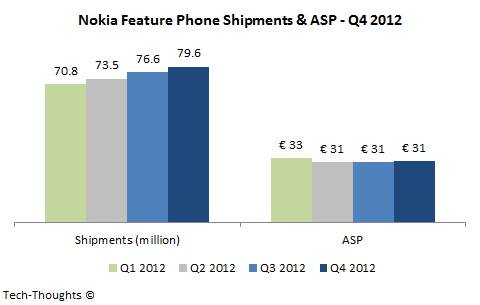 However, Nokia's pricing decisions seem to have boosted Nokia's smartphone ASP by 17% to approximately €180. "IDC has never classified Asha series as smartphones," Melissa Chau, research manager for smartphones and tablets at IDC, says. "Somebody from IDC did say that Asha series provided smartphone-like experience, but never classified it as smartphone," she tells ET over phone from Singapore. Nokia has been marketing a few of its Asha devices as "smartphones", which has helped it post modest QoQ growth in its feature phone portfolio. However, the ASP has remained roughly flat at €31. However, Nokia's Asha full touch portfolio is essentially a "Tweener" category between the feature phone and smartphone segment, and I consider it a temporary market opportunity while prices of low-end Android smartphones continue to drop. Using the Asha full touch range isn't s sustainable long-term strategy against low-priced Android vendors. 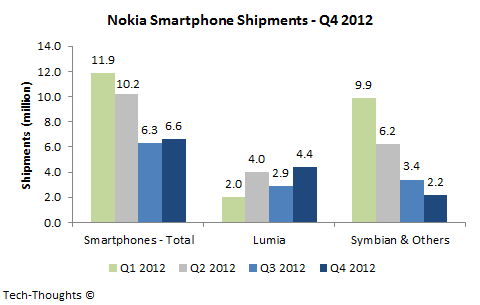 Nokia's Q1 2013 outlook is very similar to the one I had laid out in my last analysis. 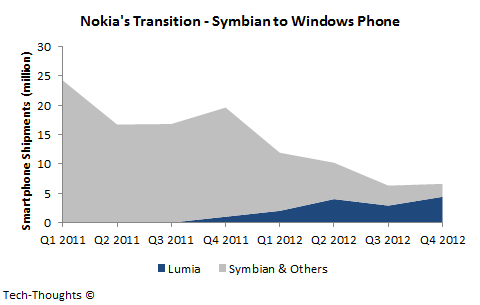 Q1 is traditionally a far weaker quarter than Q4, which should cause another crash in Lumia sales. On February 11th, 2011, Stephen Elop announced Nokia's decision to move their primary smartphone platform from Symbian to Windows Phonem with a stated "two year transition" period. We are nearly at the end of that period and Nokia's smartphone shipments have dropped from 24.2 million in Q1 2011 to 6.6 million in Q4 2012, with just 4.4 million Lumia shipments. I think at this point, it is fairly safe to state that Nokia's Windows Phone strategy has failed. Good one. Really liked this post - looking from the other side of the fence, which is Microsoft's Windows Phone strategy, this makes perfect sense now. Highly likely, that Microsoft should takeover Nokia at dirt cheap prices with the current run rate of Nokia. I heard that such a deal was on the table back when the Nokia-Microsoft partnership was initially stuck. Apparently Microsoft walked away after their due diligence process. It's possible that Microsoft didn't want to acquire Nokia as a whole and would consider acquiring only the smartphone division once it shrinks to a more palatable size (speculation on my part). Could explain the lack of action from Nokia's board so far.